MACFARLANE, JAMES, businessman, printer, editor, office holder, jp, and militia officer; b. in Scotland; m. 26 April 1834 Isura Carrington in Oswego, N.Y., and they had two sons; d. there 29 July 1847. James Macfarlane came to Kingston, Upper Canada, from Scotland shortly after the War of 1812, apparently as an assisted settler. In November 1824 he purchased the Kingston Chronicle, a leading tory paper since its establishment by John Macaulay* and Alexander Pringle five years earlier. Macfarlane announced his intention to carry on its tradition Brought up “under the British Constitution,” he was determined to be “guided by adherence to its principals”; for the next 23 years he championed the colonial executive and defended its policies. Newspaper publishing was not lucrative and Macfarlane’s circulation was limited. Like many of his contemporaries, he diversified his activities. In August 1828 he started the Brockville Gazette. He ensured that its content and politics reflected tory policies, leaving the actual editing to another; the following year he sold the paper to his editor and a Kingston associate. A steadier and more important supplement to his income came from job printing, bookselling and bookbinding, and the sale of stationery. For a time he was also the local agent for the Encyclopedia Americana. He printed several books and at least twice (in 1834 and 1836) compiled an almanac. 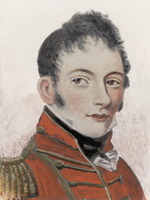 His most ambitious project, however, was the compilation and printing of The statutes of the province of Upper Canada . . . (1831). Originally, he had attempted the project on his own, but he was obliged to join forces with Hugh Christopher Thomson*, another well-known local printer, to finish it. Despite a fire in 1833, Macfarlane prospered and became increasingly involved in other commercial projects. From 1826 to 1835 he was the Kingston agent for the Alliance British and Foreign Life and Fire Assurance Company of London. In 1830, under the name of James Macfarlane and Company, he began to import garden supplies including flowers, ornamental trees, and seeds. Periodically, he speculated in land. In 1837 he transferred the bindery part of his business to a Montreal firm. His major commitment remained the Chronicle, which was the basis of his growing involvement in community affairs and gave him a voice in political matters. His interest in community affairs had begun shortly after he took charge of the paper. He provided publicity for organizations such as the Dorcas Society and the Female Benevolent Society and he willingly allowed his office to be used by a number of societies and institutions as a depository for contributions. He also frequently gave of his time and money to worthy causes promoting education and poor relief. And, as might be expected, he supported various local commercial organizations and projects. Finally, he was a member of the Presbyterian church, the St Andrew’s Society, and the Celtic Sons of Upper Canada. It is, perhaps, not surprising that town leaders such as Macaulay, John Kirby, and Allan MacLean provided public endorsements for Macfarlane’s seed business, or that he received a number of influential appointments. In 1832 he was chosen to sit on the committee responsible for examining the district treasurer’s report and also became a member of the Board of Health. The following year he became a commissioner of the Court of Requests. Respectability and growing influence brought more onerous positions. In 1836 and again the next year he oversaw the Board of Health’s responses to the problem of cholera. 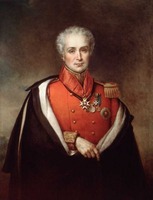 He was appointed a jp in 1834 and held the position until his sudden death in 1847. As editor of the Chronicle Macfarlane frequently proclaimed his loyalty to king, country, and constitution. He supported the executive’s policies on such matters as trade with the United States and banking legislation, and he defended its handling of the alien question [see Sir Peregrine Maitland*]. He was appalled by the activities of William Lyon Mackenzie* and the increasingly radical agitation often associated with him. An officer in the militia since 1824, he was a member of the court martial held at Fort Henry in 1838 to try the prisoners taken at the Patriot attack on Prescott [see Nils von Schoultz]. Personally and professionally, Macfarlane had come a long way since his arrival in Kingston and his success had rested on a number of factors. He had sustained a strong personal commitment to his community and to a tory view of its needs; he had also supported local philanthropic endeavours, commercial projects, and cultural organizations. These beliefs and involvements, undoubtedly sincere, were also good for business. Once he was accepted by the local élite, his success was ensured and his influence certain. British Whig, 6 April 1847. Brockville Gazette, and General Advertiser (Brockville, [Ont. ]), 1828–29. Chronicle & Gazette, 1833–47. Chronicle and News, 1847–49. Kingston Chronicle, 1819–33. Upper Canada Gazette, 12 April 1825. Upper Canada Herald, 22 Nov. 1825. E. J. Errington, “The ‘Eagle,’ the ‘Lion,’ and Upper Canada: the colonial elites’ view of the United States and Great Britain, 1784–1828” (phd thesis, Queen’s Univ., Kingston, Ont., 1984). H. P. Gundy, Early printers and printing in the Canadas (2nd ed., Toronto, 1964). Jane Errington, “MACFARLANE, JAMES,” in Dictionary of Canadian Biography, vol. 7, University of Toronto/Université Laval, 2003–, accessed April 24, 2019, http://www.biographi.ca/en/bio/macfarlane_james_7E.html.